VL Rojo El Rey 1/11 is the son of #JADL El Rey 110/5. #JADEL El Rey 110/5 is the dark-pigmented grey bull imported from Mexico, that has produced numerous champions in the show ring for V8 ranch, Heritage Cattle Company, and RB Ranch. His outstanding progeny includes the 2014 All American Grand Champion Female. 110/5 has first-rate genetics. One look at his pedigree and you are captivated. 110/5’s genetics include legendary sires such as +Madison de Manso 737/4 and + Mr. V8 777/4. 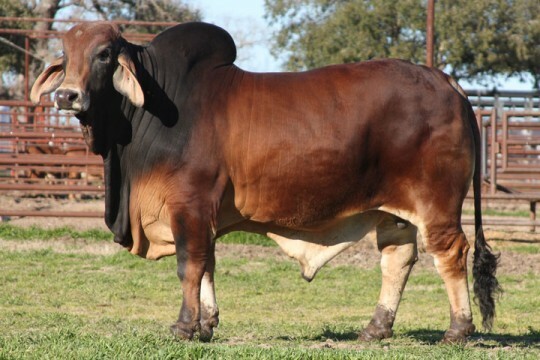 These two bulls have been the core of progress in the Brahman Breed. VL Rojo El Rey 1/11 is considered one of the best sons of 110/5 in the red Brahman breed. He has a gentle nature and clients are impressed with the amount of bone and muscle this Brahman bull displays. He is another wonderful young bull on staff at Santa Elena Ranch, and has been used extensively in the pasture and AI programs. He produces young heifers with a clean underline and super feminine features. He adds a lot of natural muscle to his calves, which normally display his gentle nature.